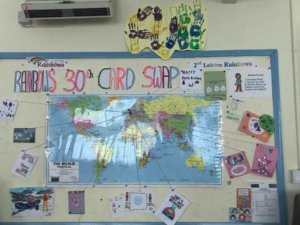 Back in November, 1st and 2nd Leiston Rainbows took part in a Rainbow Card Swap to celebrate Rainbows turning 30 years. The girls all designed a card to send to another unit and then they received one in return. The girls enjoyed learning about all the different units from around the world such as America, Luxembourg, Australia, and seeing what they do. All the cards they received were displayed on a board in their meeting place and using a map they marked out where they came from. When the display was taken down, a scrapbook was made of them all to keep and use for promotional events. Here is the collection of cards received from all over the world.